Lord, help me to walk in my integrity so that You may be glorified and my children may be blessed. Another way that I sometimes journal is with art. 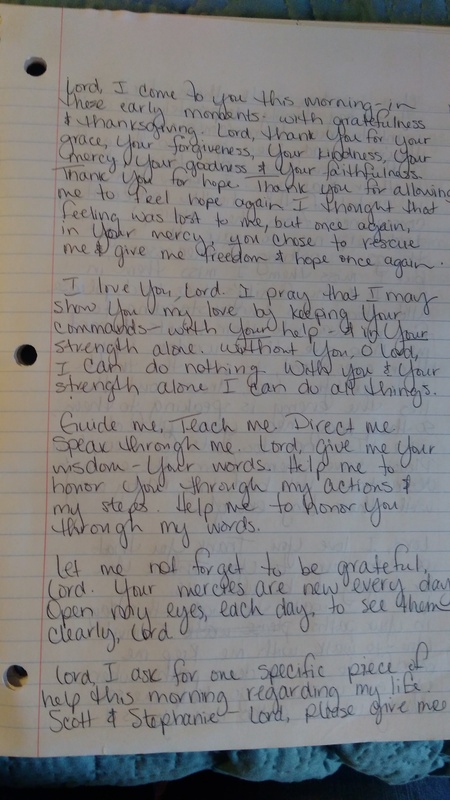 I use this type of journal often for prayer and praise. I recall this particular page well. I was feeling very overwhelmed with anxieties and fears about my daughter’s present and her future. I was frustrated with a lack of knowledge about how to help her in the moment. I was aggravated and agitated. 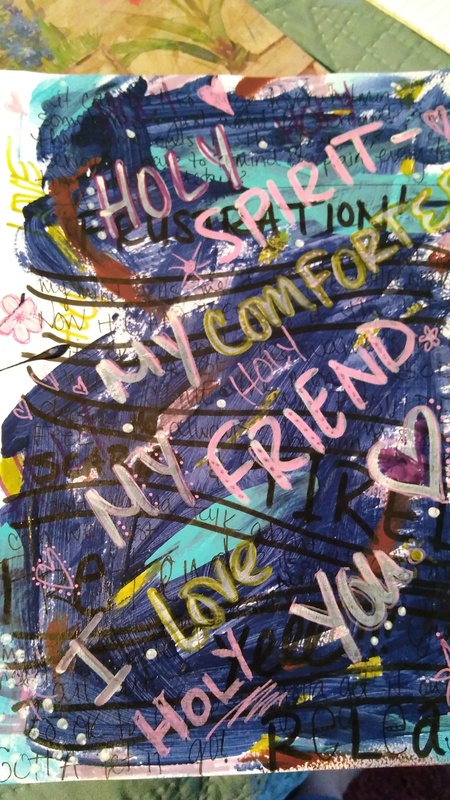 I wrote out all of the things I was feeling on my art page. But then, I went back over all of it, taking my eyes off me, and wrote in attributes and strengths of God. I praised Him and told Him that I loved Him. His perfect peace came upon me and covered all the other emotions that I felt. Now, every time I look back on this page all I feel is happiness. God is mighty and able, and He comforted me that night. This is the beautiful (to me) proof that I have of His faithfulness! I gave you the why’s for praying journaling in my last blog Prayer Journaling 101. Now, let’s get to the how. Let’s start with what I think of as the “traditional” prayer journal. I put it in quotes because there is no formula that must be followed for this, but in this type of journal, you just write your prayers. Although I pray all throughout the day, I find that it also helps me to set aside some time for focused prayer. That’s where my prayer journal comes in handy. I find that my written prayers tend to feel more sincere and focused, because my attention does not become as easily distracted. I also like the language I use when I write a little more than the informal language I use when I speak, so when I really want to give God my personal best, I write. This type of journal is also where you might want to write how you are feeling and then pray about it. Perhaps you are feeling joyful and full of praise. Write out your praises and leave that proof of His faithfulness for the next time you need to be reminded that He still answers prayers. If you are feeling overwhelmed, He already knows it. Talk to Him about it. When He created Adam and Eve, He came down in the cool of the day to talk with them. He wants fellowship with us. He has also invited us to come boldly to His throne of grace in our time of need. It’s ok to tell Him things. Write it out in your prayer journal and watch Him come to your rescue! He will. To the left, is a record of a night when I was feeling down, but had gone to the altar at church and the Lord spoke to me through a Pastor and lifted me up. I remember that service and I’m so glad I have it recorded as a reminder that my God is faithful! 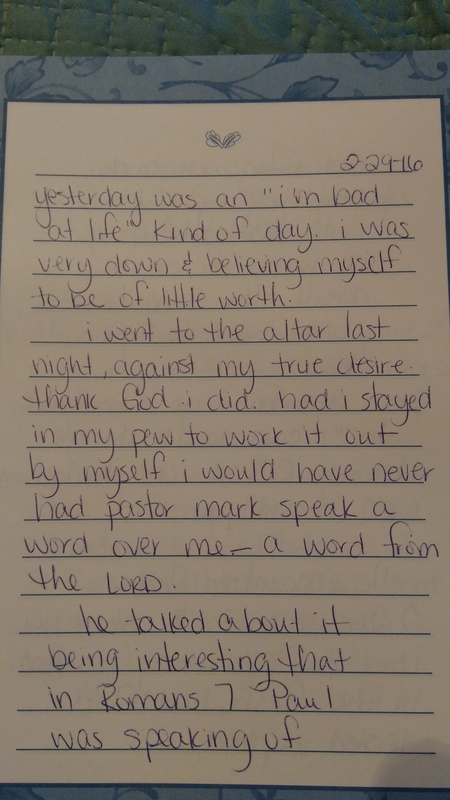 I wrote it down and praised the Lord through prayer in my journal. He deserved honor for what He had done for me. I wanted it to be known! When my kids read through that one day, they will see His faithfulness at work and know that I was grateful! 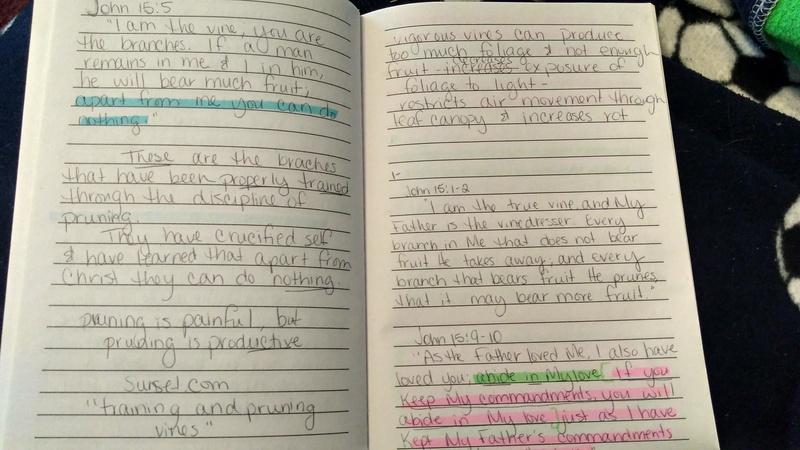 Prayer journals are also an excellent place to record prayer requests. How many people have you told that you will be praying for them? Have you been? You can write their names down and come back to them daily or weekly and pray for them. You can also leave a record and remind others as you watch God answer those prayers. I hope that you are feeling encouraged to begin a prayer journal. They aren’t anything fancy. Just a way to keep our ever-distracted minds focused as we pray, and a beautiful record of God’s faithfulness, love, and provision. Next time, I will share a few of my less traditional journal pages. They’re different, but have been helpful during different seasons of my soul. Grab your journal and pen. It’s time to start writing! I had someone ask me about prayer journals a while back and thought I would write about how they can be effective. I am also going to be sharing some of my own personal styles and pages with you along the way. Have you ever wondered if God hears your prayers? Look up the scriptures that tell you that God hears your prayers. Write them in your prayer journal and then write down your praise to Him for the fact that He hears you. Have you ever thought God doesn’t answer any of your prayers? When you write down a prayer, you can go back later and record when that prayer was answered. A lot of times, when we speak our prayers, we forget what we have even prayed, and can’t see all the wonderful things God has done in our lives. We fail to give Him praise for things He has done! Writing down our prayers gives us something to go back to so we can see the things that can be crossed off the list. God is working in our lives every day. He is faithful. Do you want to leave footprints so you can look back and see how far God has brought you? When times get hard, you will be able to look back at God’s love and faithfulness. You will see what He has done in your life and know that if He’s done it before, He can do it again. These footprints can also be left there for your family to see, as well. What a testimony to leave! Bottom line: a prayer journal may be just what you’re needing. I will share some personal examples in my next blog to help get you started. In the meantime, just know that the material you use isn’t important. It can be a beautiful journal, a $.25 spiral notebook, an art canvas, or even a blog. Over the years, I have used many different things. In this verse, Paul was speaking to the church in Macedonia about generosity, but it got me wondering what I was desiring to begin a year ago. Interestingly (and conveniently) enough, a year ago is when the Lord encouraged me to blog a Month of Prayer, so I was able to go back and read through my blogs from last year. What exactly was I desiring? Had I not recorded those prayers, I can honestly say I wouldn’t remember my desires from a year ago. The Lord has been faithful this past year. He has not only been answering prayer, but stretching and growing my family and me in ways I couldn’t have imagined. Most of the prayers were things I will need over a lifetime: to increase in prudence, depart from evil, know Him more, honor Him with my possessions, etc. The desires I had a year ago and things the Lord began when I prayed are not to be forgotten. This verse in 2 Cor. reminds me that there is not just to be a beginning, but a time of completion. It is good to take time to revisit and re-evaluate those old desires and monitor our own progress on the journey, as well. Am I still seeking after the wisdom that I desired last year? Am I still doing all I can to leave a legacy of integrity and godliness for my children and grandchildren? Have I been teaching my children how to give when it’s in their power to do so, like I prayed I would? Have I been trusting in God’s provision? Do you know what you began or desired a year ago? Is it time to complete it or to seek God’s guidance? If the Lord has already completed something for you, or is in the process now, I’d love to hear from you in the comments!! If you have forgotten what you desired, I pray His Holy Spirit will bring it back to your remembrance. We don’t want to make hollow commitments to the Lord or His work. When it comes to remembering the things we pray (what we ask for or say to God), a written record can be a very helpful thing. I will be posting about prayer journaling next. If you’ve never tried it, or want to try something new, I encourage you to check it out.